Upgraded Edgewater town home in central June Lake village location. A block form June Lake Marina! Beautiful townhome close to shops, restaurants and both June and Gull Lakes. 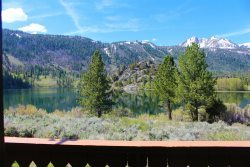 Come to June Lake for a relaxing mountain experience, in a charming comfortable townhome. Perfect for everything your family and friends plan to do in June Lake. This townhome is only one block from June Lake Marina! Also right in town, with easy access to restaurants and shopping. Spring comes alive with wildflowers, creatures, and of course the start of the fishing season. The trout are plentiful on June Lake, Gull lake, Silver Lake, and Grant Lake. Summer offers more fishing, boating, paddle boarding, swimming, biking and hiking. So unique to the Eastern Sierra, do not miss the spectacular fall colors. Fall usually is a quiet, peaceful time of year with excellent fishing and cooler temperatures. When the snow starts to fall this cabin is only a five minute drive to June Mountain ski area. This ski area is great for kids, beginners, powder chasers, and back country skiers alike. Cross-country skiing is phenomenal in June as well as ice skating, if conditions allow. Also Mammoth Mountain Ski Area is only 25 minutes away! June Lake is an ideal central location if you want to explore more of the Sierra Nevadas. There is Yosemite National Park, Bodie State Park, Devils Postpile, and the mysterious Mono Lake. At the end of the day come home to Edgewater 19 and relax on your deck watching the sunset over Carson Peak and barbequing with friends. Only a few steps to enter this charming Edgwater end unit. Enter on the bottom level where there are two rooms, a shared bathroom and a laundry area. The master has a king bed, 36" flat screen and attached bathroom. The second bedroom offers a queen bed along with a full sized closet. Continue upstairs to the main living area. The large sunny living room offers views of Carson Peak. The living room also has two queen sleeper sofas, 55" flat screen, DVD player and wood burning fireplace. Connected to the living room is the dining room and spacious kitchen. The kitchen has everything you need including an oversized fridge and range. Living area also has a bathroom attached. From the living area is a fun ladder to the open loft area which has a full bed. Walking distance to everything! Enjoy a full day of fishing or skiing and come back to relax in ths townhome. One complaint was the bedroom next to furnace was noisy every time furnace kicked on. The oven was beautiful but sometimes the oven would not stay lit. But these were minor inconveniences. But overall, the condo was beautiful and well appointed. We enjoyed ourselves and would stay in same unit again. Please let us know if you might arrive after 5pm so we can arrange to get you keys.